Proud husband Tom Weimer holds a desk model-size of one of his late-wife Dawn's bronzes. When great artists die, their lifelong works remain as glowing monuments to their talent. 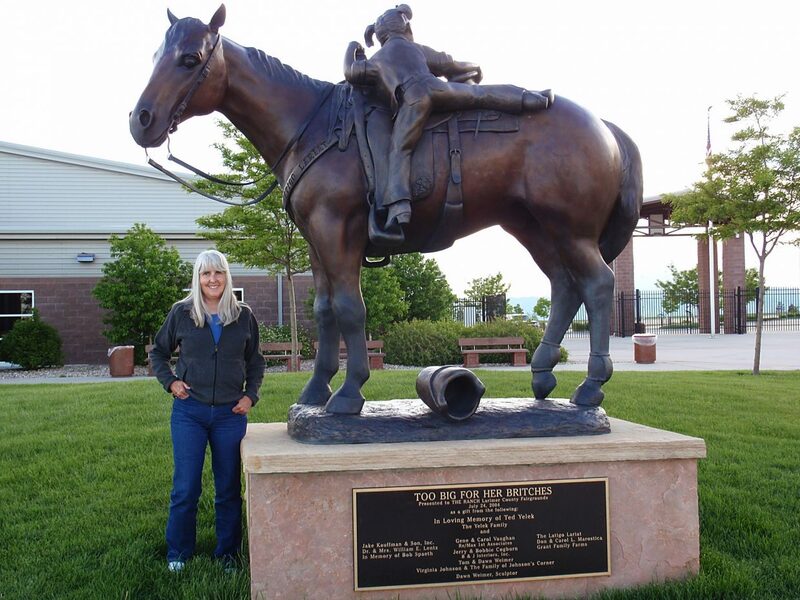 Loveland, Colo., bronze sculptor Dawn Weimer left not only such a tangible legacy, but also a devoted husband and art aficionados to champion her impressive creations. On Feb. 20, 2017, Weimer succumbed to Lewy body dementia. Her husband, Tom Weimer, said that vague symptoms of the particularly aggressive form of Alzheimer's disease had begun in 2002 but doctors didn't formally diagnose his wife's illness for several years. By 2008, although losing many physical and mental capabilities, she nevertheless urgently strived to complete more bronzes. Tom knew that his wife was passionately devoted to her art. Born in 1943, she'd started out as a painter in the late-1970s, first applying oils to her canvasses but eventually switching over to acrylics. However, once she discovered sculpting she never again picked up a paint brush, Tom Weimer said. That instantaneous transition began in August 1991. Dawn Weimer once expressed the driving force for her art: "My greatest desire is to produce work so riveting it causes one to pause, to touch, to reflect upon the glorious creation with which we are privileged to live, and to likewise embrace the love of our creator, Jesus Christ, the Son of God." Weimer's Limited Edition bronze sculptures of all sizes delight eager buyers. She portrayed human figures as well, but animals inspired the majority of her works. "Peter Rabbit," for example, began with a bunny small enough to hold in your hand but a later version measured 22-inches high by 9-inches wide by 11-inches deep … a hefty long-eared critter that sits upright to display his irresistible bronzy charm. Equines in particular urged the artist's hands to fashion them for posterity. One such life-sized piece entitled "Too Big For Her Britches" stands in monument form at The Ranch in Loveland. 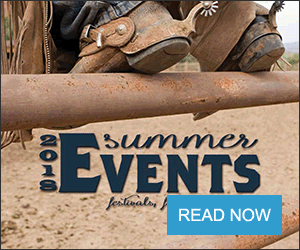 County fairgoers and people visiting the events complex stop and stare up in awe at the sight of a tiny bronze girl mounting a gigantic bronze horse. The bold child used a bucket as an impromptu mounting block but it has tipped over; no worries, the scrambling youngster is almost atop the saddle, just needing to complete swinging her right leg over the animal's back. Patient horse and its little wannabe rider stand frozen in time, a testament to youthful determination and equine loyalty. The main Fort Collins library on Peterson Street, and Fort Morgan's library (hometown of both Dawn and Tom Weimer), each installed (Fort Collins' in 1998) a Dawn Weimer work paying tribute to Timnath's famous Annie the Railroad Dog. Children especially enjoy petting and talking to the bronze image of the real-life, fabled canine beloved by railroad employees of the mid-20th century and by generations that now learn her amazing story. Tom Weimer mentioned that not long after installation, the popular Fort Collins Annie's outstretched paw had already been held by so many children that its patina had begun wearing off. Far larger on the creature size spectrum is "Colorado Ruler." 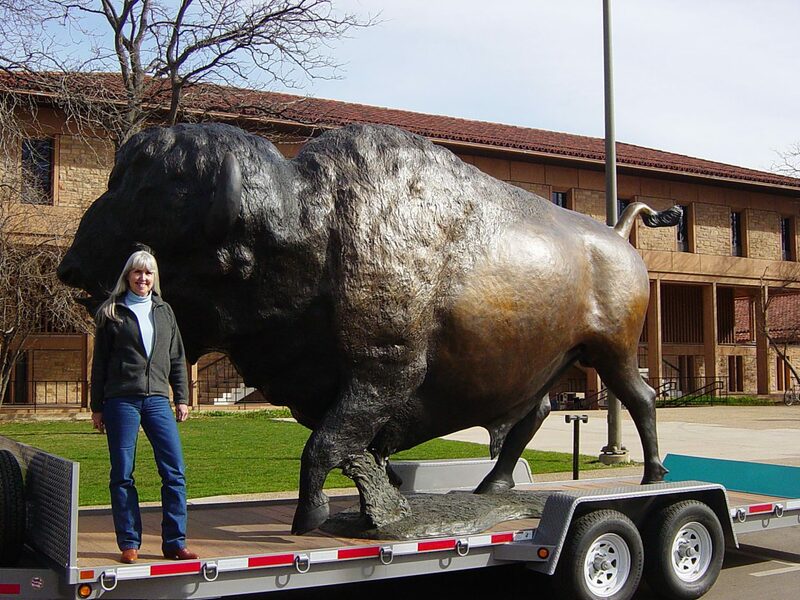 The monument version of a majestic bison (150 percent of life-size) weighs 3,500 pounds, but two table-size versions (almost sold out) were also created. Other wildlife in the Dawn Weimer Studios, LLC menagerie include a grizzly entitled "Bearly Serious" and, slinking after its prey, a cougar called "Taking Stalk." In full pursuit, another big, hungry, bronze feline is aptly named "Full Throttle." In "Rocky Mountain Rumble," Colorado Bighorn rams Old Man and Challenger battle head-to-head, their huge horns forever locked in rivalry. 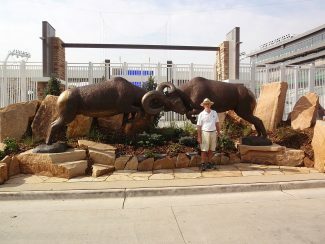 Colorado State University installed a monument size of the massive bronze on June 16, 2017, at their new Canvas Stadium. 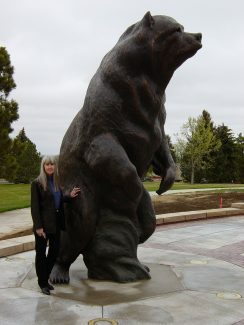 The bear depicted in "Northern Vision," while produced in four sizes, towers 12-feet tall in its largest version. Because Weimer's lifelike works exude each animal's unique personality, people came to love not only the bronzes but their artist, said Tom Weimer. He was astounded to see grown men, when learning of her failing health, break down crying. Although already ailing, Dawn Weimer somehow finished 13 different forms of "Rocky Mountain Rumble" in 2006. Gary DuChateau, a point-up man (enlarges sculptures), had worked on some of her previous pieces. When her health situation became apparent to him, he delivered 21-foot-long Styrofoams of each separate ram in just 30 days. Tom Weimer marveled because that process normally takes about six months. Dawn Weimer then applied 1,400 pounds of 1/4-inch thick clay onto them. It took her six months working twice per week, three hours maximum each session; an incredible pace considering she could no longer feed or dress herself and could barely speak. In her artistic lifetime, Weimer completed a total of 130 original, Limited Edition pieces (cast in various sizes). She always worked as fast and furiously as she could, as if somehow suspecting time was as limited as the number of her bronze editions. Now, a little more than a year after his late-wife's death, Tom Weimer works furiously to continue her vision. He has several inspired ideas on how to honor her. 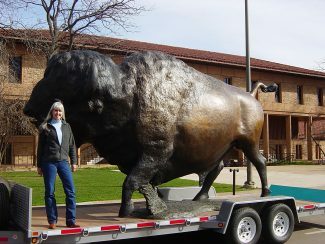 Colorado University in Boulder so-loved "Colorado Ruler" that they gifted some donors with smaller replica versions of the buffalo, and will do likewise in the future … in perpetuity. As a 1966 Colorado State University graduate, Tom would love to work with his alma mater in a similar program. Immediately following the installation of "Rocky Mountain Rumble" at Canvas Stadium, university speakers at the event declared "This is our icon." Through the 3-D printing process, Tom hopes CSU will choose to get that ram icon into the hands of VIP donors. A minimum of 50 to 60 replicas, paid for by philanthropists, would be a fitting "thank you" to those who donated approximately $60 million towards the $220 million price of the new, on-campus stadium. Each donor's replica would be personalized and its retail price will be discounted. Tom has approached potential financiers for the CSU project in hopes they'll come on-board to buy the replicas for presentation. He estimated it will take about a year after the deal is approved to pour the bronzes. His target is 2020, which will be CSU's 150th anniversary. 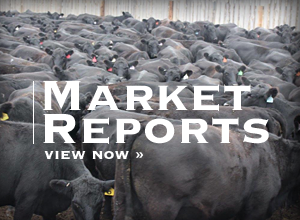 "This is just the beginning of something so unique," Tom Weimer said. Another concept Tom is investigating is a series of children's sculpture gardens. He's currently working on this exclusively-for-kids notion in Wyoming. 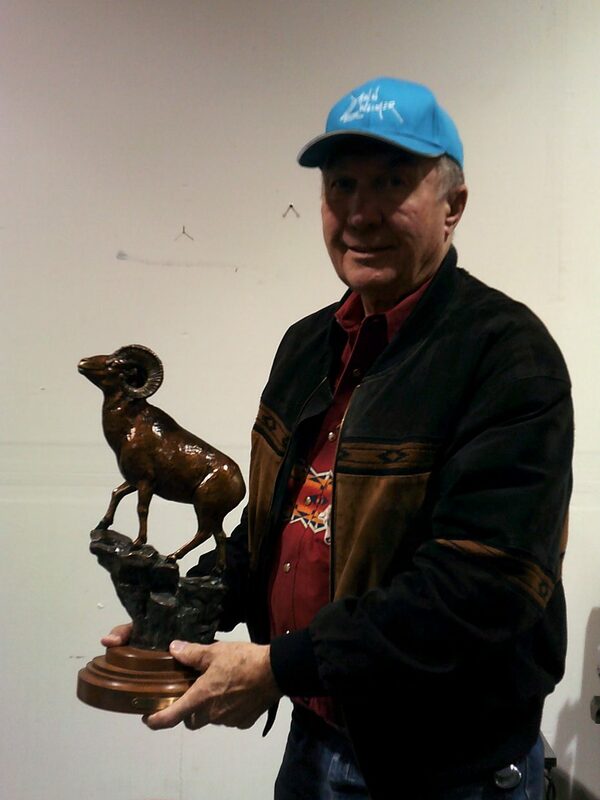 In spring 2018, he proposed to Larimer County adding 40 bronzes (28 of which would be his wife's) along the entryway to The Ranch Complex. To date, he's not yet heard back from them. Tom Weimer had found it necessary to quit his job in order to care for Dawn during her illness. He admitted it's been difficult for him to recover from that nine-year period post-diagnosis until her death last year. Working full-time to promote her works is likely as therapeutic for him as it is advantageous to those who collect her highly sought, valuable art pieces.